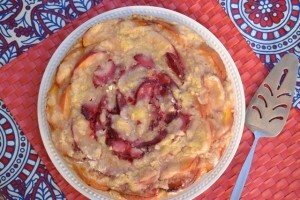 The peach-plum kuchen, waiting for the topping before it will be baked. Peaches or plums? In summertime, fortunately, you don’t have to choose. One of our favorite ways to eat peaches and plums is combined together in a homemade küchen. Küchen is a German word for cake, and in this case it refers to a fruit dessert that is sort of like a pie, but with a cake-y bottom. Jolly Tomato’s mom, who is German, makes these at least once a week all throughout the summer with whatever fruit is freshest. (Given that she started baking when she was 10, she’s been making kuchen for more than 60 years, so we bow down to her experience.) Apple küchen is wonderful, and don’t even get us started on the deliciousness of rhubarb küchen, but when it comes to summery freshness and cheery colors, the peach-plum combination can’t be beat. We served this tonight at an early Fourth of July dinner, but you can make it all summer long until the peaches and plums run out. All baked and ready for the picnic! Preheat oven to 350 degrees. Sift together flour, baking powder, salt, and sugar. Cut in butter with a pastry blender until mixture is soft and crumbly. In a small bowl, whisk together egg and milk and then pour into flour mixture. Stir together until a soft and sticky dough is formed. Press the dough into a 10-inch tart pan, covering the bottom completely. 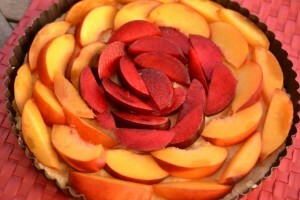 Cut the peaches and plums into evenly shaped slices, arrange on unbaked crust. In a small bowl, mix together sugar, flour, and cinnamon; then cut in butter with a pastry blender. Sprinkle the flour-sugar mixture over the fruit. Bake at 350 for 45 minutes. Serves 8.